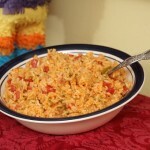 NOTE: Mexican rice is a wonderful side dish to any Mexican entrée, and this one is exceptional. You will love the crunch of the green onions, jalapeno, and cilantro. Place olive oil into a large heavy skillet. Let oil heat up and add rice. Set timer for 8 minutes and begin to stir rice, every 30 seconds to 1 minute. Rice will turn a golden color. Add the chicken stock, and allow the rice to start bubbling. Continue to stir rice for another 6 to 8 minutes, until most of the chicken stock is absorbed. Add the tomatoes, tomato sauce, onions, cilantro, jalapeno and cumin. Add ¼ cup water if mixture seems to thick; stir the vegetables and seasonings until blended. 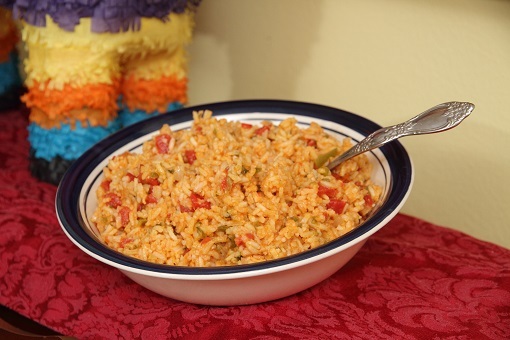 Place the lid on the skillet over medium low heat, and let the rice cook for 10 minutes. Remove lid, stir rice and add the remaining ¼ cup water to loosen the rice. Rice should be a little crunchy, not over cooked. Taste, and add salt and pepper as desired. Serves 6 to 8.